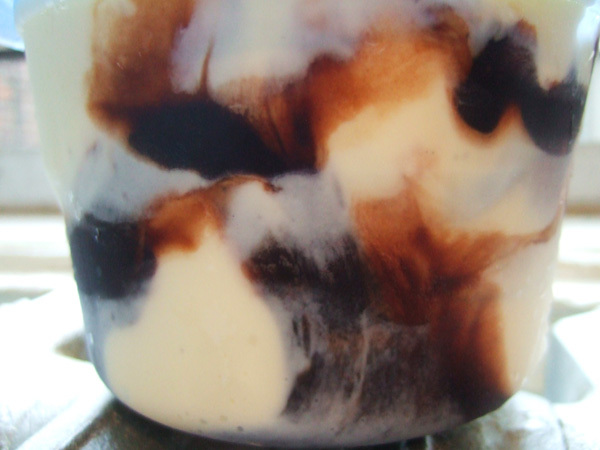 How to make a chocolate swirl. Then you put it in the freezer. When you scoop it, it comes out like a chocolate swirl. 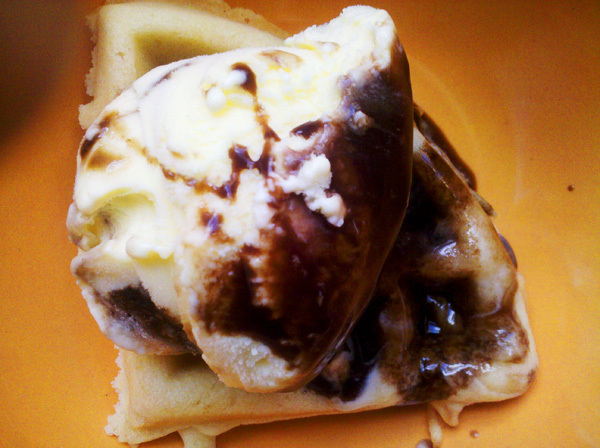 I layered my vanilla bean ice cream with U-Bet Chocolate Syrup. For my class, I did a lot of research on the history of ice cream in America. I got really curious about the origin of the ice cream cone when I stumbled across this article from Saudi Aramco World: Zalabia and the First Ice Cream Cone. SAW is a cool publication from which I’ve previously cooked some medieval Middle Eastern recipes. The Louisiana Purchase Exposition, also called the 1904 World’s Fair, was the largest the US had seen since the 1893 Columbian Exposition in Chicago. It covered some 500 hectares (1235 ac) and showed off such inventions as the year-old airplane, the radio, the telephone switchboard and the silent movie… (There were also less memorable attractions, among them a butter sculpture of President Theodore Roosevelt and a bear made out of prunes.) With more than 18 million visitors passing through the Exposition over its seven-month run, there were also scores of vendors offering much to eat. (Ernest) Hamwi and his wife, the story goes, took their meager life’s savings and invested them in a zalabia booth, joining other like-minded immigrants from the Levant in attempting to transplant to the US the crisp, round, cookie-like snack so popular back home. Each zalabia was baked between two iron platens about the size of a dinner plate, hinged together and held by a handle over a charcoal fire. They were served sprinkled with sugar. The Hamwis wound up doing their cooking next to one of the approximately 50 ice-cream stands dotted around the fair, though exactly who owned the stand is in some doubt: It was either Arnold Fornachou or Charles Menches. Whoever it was, his ice cream sold faster than Hamwi’s zalabia—so fast, in fact, that one day he ran out of clean glass cups. At this moment, some say, the ice-cream man saw the possibilities of the zalabia; others claim the zalabia man saw the possibilities of the ice cream. It’s Hamwi himself who originated this story, in an ice cream trade journal, and is generally credited with inventing the ice cream cone. However, his story has never been proven, nor has there been any evidence found that he had a booth at the fair at all. But people do seem to think that the 1903 Exposition is the time and place that ice cream and cone met, and that the pizzelle-like zalabia had something to do with it. I got curious to make a zalabia, which hail from Lebanon, Syria, Greece and Turkey. However, when a scoured the internet for a recipe, all I could come up with were recipes for north-African zalabia, a yeast-risen, deep-fried dough with honey syrup. Not the same. I ended up trying out this Martha Stewart recipe for waffle cones, but being that I don’t have a pizzelle maker, I ended up making waffle cones. The result was freaking delicious, but not what I had set out to do. If anyone out there has a zalabia recipe, hit me up! In the meantime, read the rest of the fascinating Saudi Aramco World article here. The English think they invented the cone and I saw pictures from the mid-19th c that had little cones as part of a dessert… it’s a tough one and so many vie for the title!